Two young Mountaineers tell their story of how they got started climbing. Ever since we were quite young, the out-of-doors has been an important companion in our games and studies. As we grew older, however, a dream to partake more seriously in the joys and dangers of the wilderness took firm root. When our family moved back to our native Pacific Northwest after living in the rural Midwest and East for a number of years, it began to look like the dream might just become a reality. Our father recommended that we see if the Mountaineers had any programs we might be interested in. 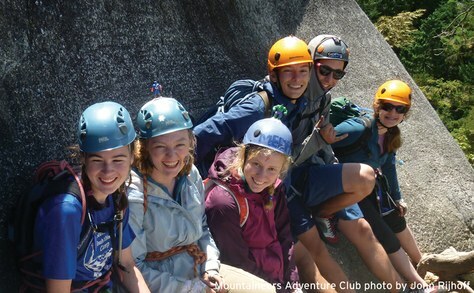 We did some research, and discovered that indeed, they had a program: the Mountaineers Adventure Club (MAC). Our mother contacted Becca Polglase, Director of Education at the Mountaineers. She suggested that we come to the next meeting. Thus, one memorable Wednesday night near the beginning of January 2013, we arrived at the Mountaineers Program Center for the first time. Our rather extensive experience with being new told us that we might expect to feel at least a little left out and uncomfortable. When we entered the Cascade Room, we were greeted by several very genuine and welcoming girls of our own age. So far, we were pleasantly surprised. We sat down at a corner of one of the tables, trying not to hide behind each other, yet hoping to be inconspicuous at the same time. As the meeting commenced, a look down the room showed what appeared to be an endless row of teenagers. They all seemed to be very good friends, and had that fresh, happy, peaceful look that comes from spending plenty of time in the mountains. We were pretty sure that it was a hopeless task to ever learn more than a few names (wrong), but were also sure that this was a group of very friendly people that we were interested in becoming a part of. So we signed up for our first trip. Now we are honing in on our one-year anniversary of joining MAC. During that time, climbing, camping, and the mountains have become a permanent part of who we are. Our bedrooms are adorned with sleeping bags, backpacks, and water bottles. It is hard to believe that there was once a time when we were not a part of this group. When we joined, we had not the faintest clue of how to use an ice ax; we were unaware of how heavy a backpack is at the start of a 52-miler; and we didn’t know how to put on a climbing harness. Now we have been on our first alpine climb (Unicorn Peak); we are fine with going a week without taking a shower; and we climb regularly at a local gym. As a group, we learn the skills necessary to climb the mountains. In turn, the mountains teach us about ourselves. Through the challenge of pushing through the crux of a difficult climb; the misery of a cold, wet night in the snow; the fear of meeting exposure for the first time; and the exhilaration of surveying the world from a hard earned peak, we find strength, and weakness, that we might otherwise never have realized. We learn to trust ourselves in situations where one mistake could cost us our life. We gain confidence, finding the courage to speak up if something isn’t right. We learn to know and respect our own limits, stretching and expanding them, without pushing too far. Due to the nature of the group, we learn more than mountaineering skills on MAC. As members, we as a group run our own meetings, come up with trips we want to go on, research the details for each trip, and learn the skills needed for successful completion. We have learned – or rather, are learning – how to compact a long presentation into ten minutes; how to efficiently communicate infinity plus one details; how to rectify the situation when a piece of important information is accidentally left out of the last email; how to put a complex idea in simple terms; and how to properly write minutes from a meeting. This is just a sampling. Each time we get together there are more ideas, more skills, more jokes, more stories. We are assisted each step of the way by two exceptionally skilled adults, Becca Polglase and Madden Coghlan. All right, maybe more than two – none of us could do this without our incredible parents, and the wonderful instructors who willingly volunteer their time for us. In the end, we’re out there to have fun. As we work hard together, learn together, make mistakes together, and through it all, laugh together, we become a very close, ever growing group of friends. We look forward to meeting new people, reaching new summits, and growing in appreciation, respect, and love for the mountaineering tradition we are becoming a part of. About the authors: Isabelle and Carolyn joined the Mountaineers Adventure Club in January 2012. In just a year, both have completed multi-pitch climbs, an alpine climb and a 5-day backpack, among many other activities. Both received their certification in Wilderness First Aid and help instruct newer members in alpine and rock skills. Carolyn is the 2013-14 Secretary. This article originally appeared in our January/February 2014 issue of Mountaineer magazine. To view the original article in magazine form and read more stories from our bi-monthly publication, click here.